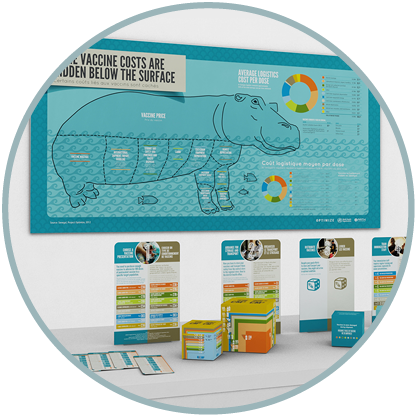 We harness the power of visual communications to clarify complex information and inspire positive change. The visual manifestation of your purpose, built for the long term. Setting a creative vision that can be realized in any media. Producing materials that are vital for impact. based in seattle. collaborating worldwide. Our work has been viewed — and touched — on five continents. From highlighting digital immunization registries in Albania to developing behavior change communications in Zambia, we're reaching for impact around the globe. Our clients are experts in their fields. They are vision-setters and change makers. They “know their stuff” but need help sharing their knowledge more broadly. Design can elevate — bringing attention to important causes. Design can clarify — making highly complex information engaging and understandable. As a partner and collaborator, we amplify their efforts at the focal points of change. Our best work is before us. RRD Design is led by Rebecca Richards-Diop, a veteran visual problem-solver supported by a network of independent practitioners. Our team is intentionally agile, and the principal is involved in all projects. Clients benefit by having direct communication with the creative team through a single point of contact while working on a wide range of materials. on site at "the riveter"